Westfield Century City wants your business. And they have the free bike valet to prove it. Instead of fighting to keep bike lanes and the bicyclists who use them from besmirching their businesses — as merchants on North Figueroa and York Blvd in Northeast LA have done lately — Westfield Century City is throwing open the doors for people on bikes. The Westside shopping center, which sits at the eastern terminus of one of the city’s most popular bike lanes, wants your business. No, they really want your business. As I hinted yesterday, the busy mall is planning a new Bike Station, which will be the first in the city of Los Angeles. And just the second to be found north of Long Beach, following the highly successful Santa Monica Bike Centers. Now Westfield’s Assistant General Manager Louis Schillace tells me they’re offering a free bike valet service. In fact, it’s already open, with the first signs going up along the eastbound Santa Monica Blvd bike lane on Tuesday. Just ride up to the valet station at the front of the shopping center anytime between 10 am and 11 pm, and the Valet Ambassadors will issue you a ticket and lock your bike in a secure storage area while you shop, take in a movie or just hang out for awhile. Particularly nice now that they charge motorists a minimum of $1 for parking — which rises dramatically after three hours. And which doesn’t seem to have done anything to diminish the demand for parking, as both levels of the upscale mall’s massive parking lots are often full. As someone who’s lived in the area almost as long as I’ve been in Los Angeles, I used to avoid driving to the mall from Thanksgiving to New Years, when the holiday shopping frenzy meant long waits and endless circling for one of the few available parking spaces. Now the popularity of Westfield Century City’s stores and restaurants, combined with one of the city’s busiest movie theaters, means that parking backlog exists year round, on most evenings and every weekend. Which is probably why their parking valet is always packed. And why they’re building a new 500-space parking garage next to Gelson’s and the aforementioned AMC Theaters. But unlike most malls in auto-centric LA, they get it. They understand that bikes mean business. And that giving people an opportunity to get out of their cars and ride to Pink Taco, the Apple Store or the latest Hollywood blockbuster on a typically perfect SoCal day means fewer cars clogging those parking lots and the streets leading up to them. And that replacing their old, hidden wheel bender racks with safe, secure and convenient bike parking is the best way to entice us to open our wallets. Meanwhile, the free — and yes, I can’t seem to mention that enough — bike valet is only the beginning. In the near future, what Schillace assures me will be a state-of-the-art bicycle facility will provide an even better option for local riders. The Bike Lockers will be in our secure valet area and heavily monitored. There will be access control to ensure the safety of the bikes. We will have male and female changing rooms with showers available for people who bike to the center and wish to freshen up. Sounds perfect for people who commute to work in Century City. And once again, the plan is for the lockers to be free, though that may change depending on demand. I’m usually not one to recommend going to a mall. Let alone actually shopping in one. But I’d love to see their bike valet swamped with bicycles this weekend, and every weekend to come. Along with an uptick in business to confirm they made the right choice. And encourage other LA businesses to follow their example. And while you’re there, be sure to stop at the concierge booth or mall offices and say thanks. On the other hand, one of LA’s leading landmarks could stand to show some serious improvement. Bike advocate Niall Huffman rode to the Hollywood Bowl on Sunday for a show featuring, as he put it, “badass Mexican guitarists Rodrigo y Gabriela along with DeVotchka and Lord Huron.” But when it came time to park his bike, he found the situation sadly lacking. Leading to this email to the Bowl’s management. I strongly encourage the Hollywood Bowl to re-evaluate how it accommodates the parking needs of patrons who choose to arrive by bicycle. I recently rode my bike to an event, and found the designated “bike parking” (i.e., a railing around a tree next to the Main Gate) to be a joke. By the time I arrived 15 minutes before showtime, the entire outside of the railing was occupied by locked bikes, and I had to hoist my bike and clamber over the railing in order to find a space to lock up. Because the height of the railing interfered with my handlebars, it took me several minutes to figure out how to move the frame of my bicycle close enough to the railing to be able to lock it securely. A picture I took of the designated bike parking area — overflowing with locked bikes — may be viewed at http://goo.gl/7cFVA. I found the whole experience to be undignified and unworthy of the Bowl’s reputation as a world-class live music venue. Beyond this, I am disappointed that the Bowl’s management has yet to see the wisdom of making arriving by bicycle a more convenient experience. Bicycles, after all, take up much less space than automobiles and do not contribute to the pre- and post-event congestion on surrounding streets for which the Bowl has become famous. In a time when the City of Los Angeles is seeking to encourage public transit, bicycling and walking as alternatives to sitting in traffic and making significant investments in improvements for users of these modes, the failure of large destinations like the Bowl to accommodate bicyclists at the end of their trips is holding back the achievement of this worthy policy goal. This is all very frustrating because it would be remarkably easy for the Bowl to support the proper parking and locking of bicycles. Properly designed bicycle parking can accommodate 8 to 12 bikes in the space it would take to park one car, and standard U-shaped racks accommodating two bikes each can be bought and installed for around $100-200 apiece. Surely there is space somewhere on the Bowl’s property and in its budget for a few dozen of these racks. If you require more information about how to provide proper bicycle parking, I recommend consulting the Association of Bicycle and Pedestrian Professionals’ “Bicycle Parking Guidelines” (available at http://goo.gl/k3KOl), which contains standards for the shape, spacing and siting of bike racks. 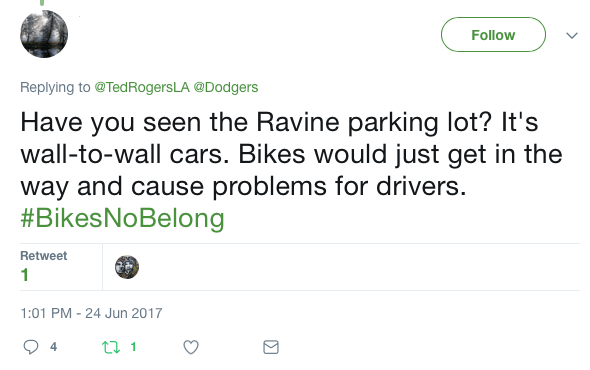 It would also be a good idea to review the Los Angeles Department of Transportation’s guidelines for bike parking (http://goo.gl/vXOBY). It is key that any new bike racks allow for the frame — not just the wheel — of the bicycle to be locked, and that they not require the bicycle to be lifted off the ground. It is my sincere hope that the management of the Bowl take this problem seriously and work in good faith to address it. I look forward to many more years of riding my bike to events and being treated with the same respect and dignity as any other Bowl patron. UPDATE (7/16/13 5:19 pm): I’m told the Bowl provides a sweet bike rack to its employees and that there’s at least one bike commuter in their marketing department who’s working on improving the bike parking for event patrons, including discussing the possibility of having the LA County Bicycle Coalition coordinate a bike valet. Good to hear things may be getting better! On a sadder subject, I’ve gotten a report that another bicyclist has died in Pasadena. However, I haven’t been able to get any confirmation yet; let’s hope it’s not true. And offer a few prayers just in case.